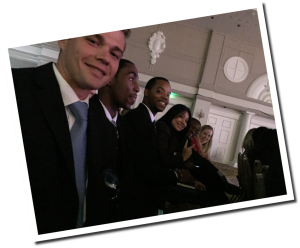 Fire Inc's Rising Stars Attend National Marketing Conference | Fire Inc.Fire Inc.
During the weekend of July 25th. the top performing staff members of Fire Inc, along with the management team, attended a national marketing conference in Nashville, TN. Over 2,000 professionals from over 250 different companies in the direct sales and marketing industry attended several workshops, networking events, and an awards dinner. During the event, guest speaker Jennifer Bricker gave a phenomenal speech regarding motivation and persistence in overcoming obstacles. Many of Fire Inc’s staff were able to take home some solid concepts from this speech and apply it to their own professional situations. What Was Your Favorite thing About the Conference? Saturday night’s dinner was a great opportunity for networking. Being part of the Soul train/ conga line was the BOMB. I was able to walk on stage to feel what it is like to be up on stage like a rockstar! To know my “why” and persevere through all obstacles to get to my goals. If a man that worked at a hotdog making factory went from doing that to being a top contender than SO CAN I! Hearing the intensity of the fight that certain people put out to no just quit but put themselves in a better position than previously. The end result wasn’t on par with doing well it was superseded with what we deem is great success. Evaluation of a person’s learning process is more important than my approach to coaching them myself. I may be able to direct them to a better source for coaching and learning. The Guest Speaker Jennifer Bricker. She is a true inspiration. That the sky is the limit. If one has the right mindset anything can be done. All it takes is the right mindset with a bit of confidence. Impossible is nothing. Being able to network and getting to hear the top ranked owners talk about their big picture goals. Everyone has their own motivation. Being able to hear what motivated them reach the top encourages me to be the best me! The fundamentals that I am taught are important. Continue to learn from those that are at the top. The genuine nature of leadership and the big picture view of where my opportunity is headed. Not to over-complicate anything in business. Just continue implementing the basic fundamentals that I am taught daily and I’ll see the results. Seeing each and every individual’s level of passion and commitment toward the business. I enjoyed seeing the different faces of success on stage and hearing what it took them to get there. Jennifer Bricker was also amazing! That success is all about mentality and self belief. In order for me to get to where I want to be all I need to do is give it my all every day, learn from each day and improve on effort. I am a ship sailing across the ocean and my goal is the wind that will take me to my destination. The more powerful my goal, the stronger the wind! I enjoyed listening to the guest speaker Jennifer Bricker. I saw the video about her on facebook and when I saw I could not believe that I was seeing her live in person. Her story is powerful and truly an inspiration to understand that the word “can’t” does not exist. The only limit in life is yourself and your mind. You have to believe that you can do everything. My career plays a very important role in the business. I can achieve all my goals by simply continuing to learn and giving it my best effort. Throughout the course of the year, the staff of Fire Inc has numerous opportunities to attend networking events, seminars, and conferences to further their professional development. This particular event had the largest number of professionals from around the country in attendance and served as a great way for the staff to mix and mingle with like-minded professionals. For more information on Careers at Fire Inc, visit our training page.